Shiatsu enhances performance in you and your equine athlete. Regular sessions support you both in training and development, working in all disciplines: dressage, show jumping, eventing, racing, endurance and hacking. Alexandra is fully trained in equine and human shiatsu, as well as craniosacral therapy. I combine my skills, responding to the individuals’ need in each moment. 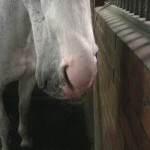 Horses are brilliant communicators, clearly guiding me to areas that need to release tension. My passion is to support the horse – human partnership through bodywork and awareness, bringing greater harmony to the ridden experience. For 16 years I have taught riders pre- and post ride techniques to support their mounts and themselves. Please consider that veterinary permission may be required prior to Shiatsu sessions for your horse. Shiatsu supports any conventional medical treatment you or your horse may be receiving. Equine Shiatsu Association research project: Its aim is to measure the effectiveness of treatment in regards to the severity of symptoms over the period of time the horse is receiving Shiatsu and the owners’ perception of their horses well-being. To take part in the study, a commitment to 3 sessions for the horse is required. To promote this venture, I am happy to come out, offer a demo-talk and taster treatments. As a special offer to support the research project I will do the 3 treatments for the price of 2, which will be £100. I may ask for a contribution to travel cost for journeys further than 10 miles.